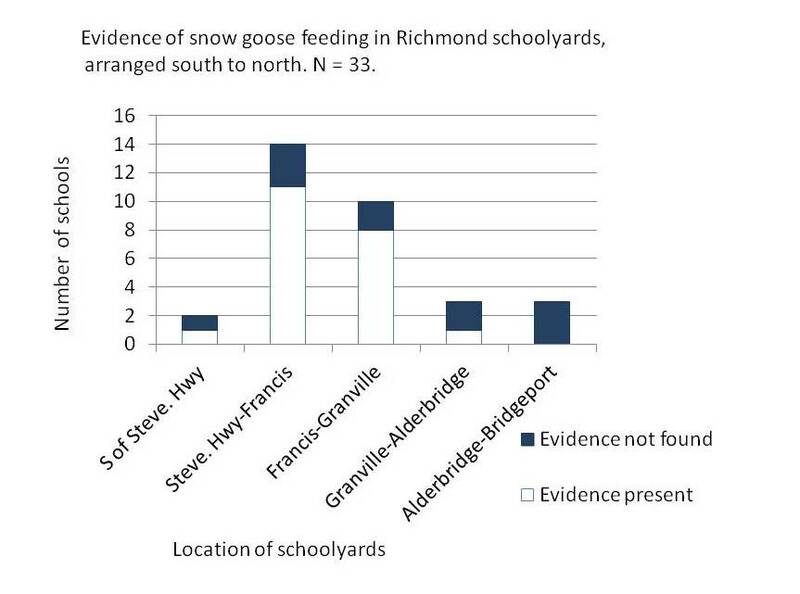 Rock Paper Lizard: Which Schoolyards in Richmond Snow Geese Prefer to Feed on, and Some Potential Reasons. 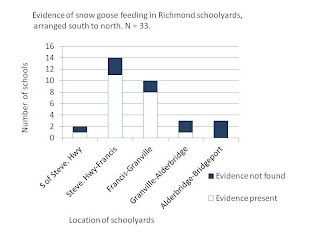 Which Schoolyards in Richmond Snow Geese Prefer to Feed on, and Some Potential Reasons. This blog receives a steady stream of hits from those seeking information on the occurrence and habits of Lesser Snow Geese in Richmond BC. I have written a number of posts on the geese, several per winter over the last four years. Some have been informative, others have been whimsical. (Click on the "snow geese" label at the bottom of this page for a parade of those posts, especially if you are looking for images.) For the sake of completeness to date (April 2012), in this post I'm including the text and some of the graphics from the science project of a Grade 6 student. The project was presented as a 3-panel poster at a school science fair, which unfortunately was disassembled soon after the fair was over, and no evidence of its existence remains. So here, for posterity, as well as for the information it contains, is a blog post approximation. 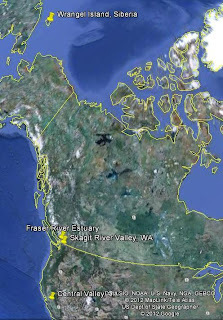 A large subgroup (Pacific sub-population) of the total population of Lesser Snow Geese that breeds on Wrangel Island in Siberia migrates south to spend parts of the winter in Southern British Columbia and northern Washington State (60% of Pacific sub-population) or in Central California (40% of Pacific sub-population). The main part of the natural diet of snow geese is the rhizomes (horizontal underground stems) of marsh plants, especially in intertidal marshes. 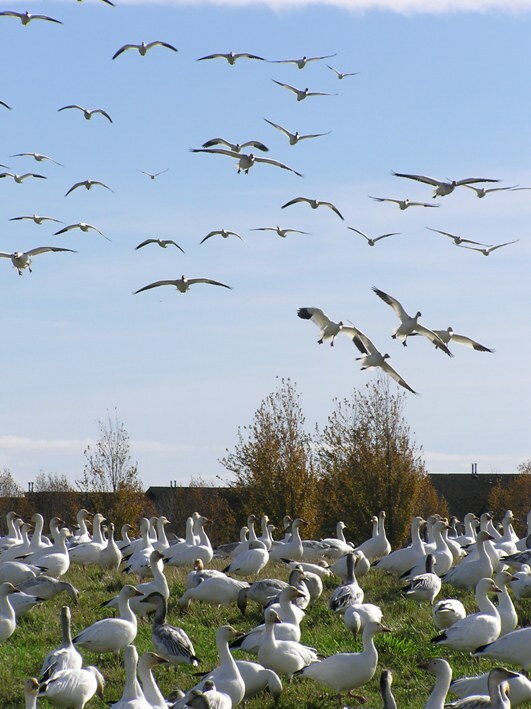 Historically in British Columbia, snow geese have fed in the marshes of the Sturgeon Banks and Roberts Banks (Richmond and Delta) for part of the winter, and then during mid-winter moved south to the Skagit Valley in Washington to feed. 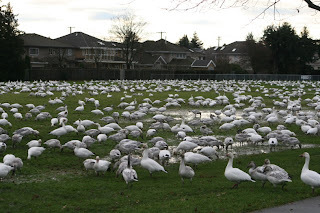 In recent years the Fraser-Skagit sub-population has increased to between 60 and 70 thousand, and since 2008, thousands of snow geese have adopted the habit of feeding on the fields of schoolyards in Richmond, ripping up the grass to eat the rhizomes. 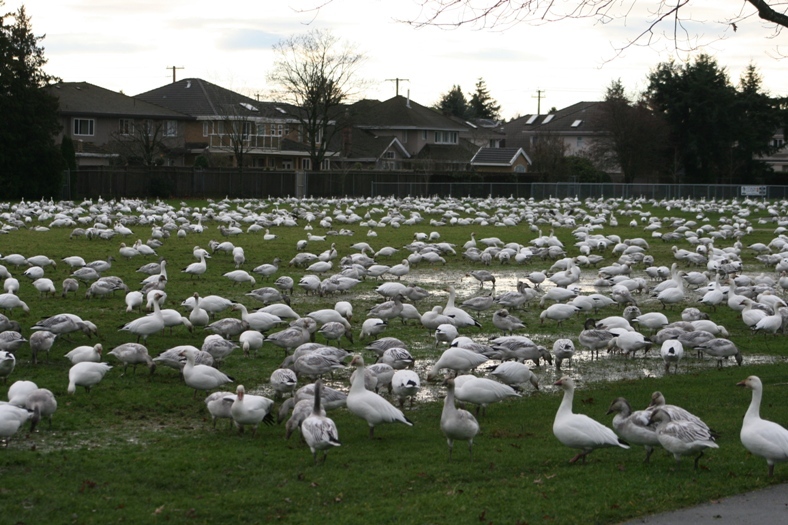 Many snow geese now remain in the Richmond area for the entire winter, using schoolyard grass as a main food supply. 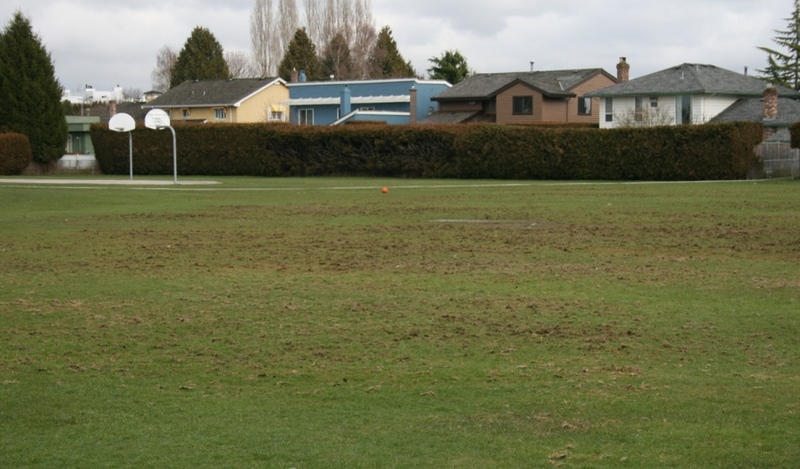 This has created a problem, as the playing fields of some schools have become reduced to large areas of mud, and large amounts of goose droppings have been deposited on walking paths. The purpose of this project is to find out if snow geese prefer to feed at certain school fields, and if so, why this might be. In addition, it was hoped to discover factors that cause some schoolyards to be damaged severely by geese while others are not. 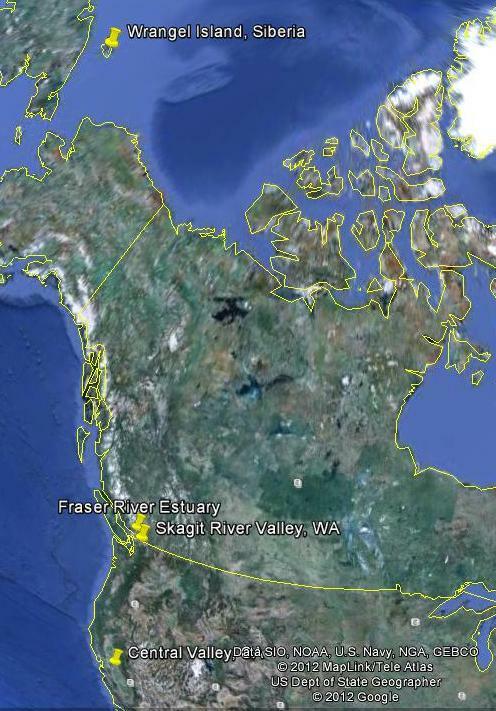 Google Earth Image showing breeding range of Lesser Snow Geese (Wrangel Island, Siberia) and wintering locations of Pacific sub-population in British Columbia (Fraser Estuary), Washington (Skagit Valley), and California (Central Valley). 1) Snow geese would prefer to feed on fields closest to the natural marsh habitat at the shore. 2) Snow geese would prefer large open areas that in size resemble the large areas of marsh at the shore. 3) Snow geese would prefer wetter fields to dry fields, because they are more similar to marshes. Evidence of geese (direct observation of geese, old or recent droppings, grass ripped up to expose rhizomes). Damage done to grass was graded as light (grass blades ripped up in small patches), moderate (grass ripped up and some areas with soil exposed) or heavy (large areas of exposed mud with grass completely removed). School field showing moderate snow goose damage (Ferris Elementary). 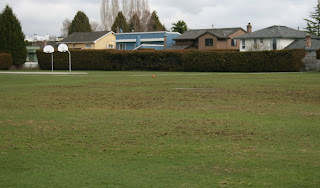 School field showing heavy goose damage (Lee Elementary). Conditions of each field were noted (surroundings: backs of houses, other buildings, numbers of tall trees; areas of standing water). Using Google Earth, the dimensions of the school fields were measured, and the areas were estimated by dividing areas of grass into rectangles. Using the main roads of the City of Richmond, groups of fields in one-mile wide strips were compared from west to east (from the marsh inland) and from south to north. 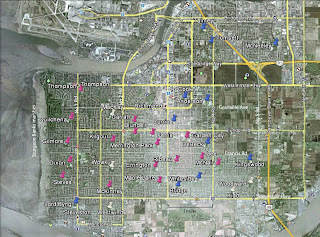 Map created using Google Earth showing school yards investigated. White pins indicate evidence that geese have been present, but have not caused moderate or heavy damage. Pink pins indicate moderate to heavy goose damage. Blue indicates no sign of geese. This winter, snow geese have spent time at school yards throughout much of Richmond. Almost all schools investigated west of No. 3 Rd showed evidence of geese (except for Lord Byng), and 20 of 26 schools (77%) south of Granville Avenue showed evidence of geese. East of No. 3 Rd. only 6 of 16 schoolyards (38%) showed signs of geese, and north of Granville Avenue, only 1 of 6 schools (6%) showed signs of geese. Of the 16 schoolyards west of No. 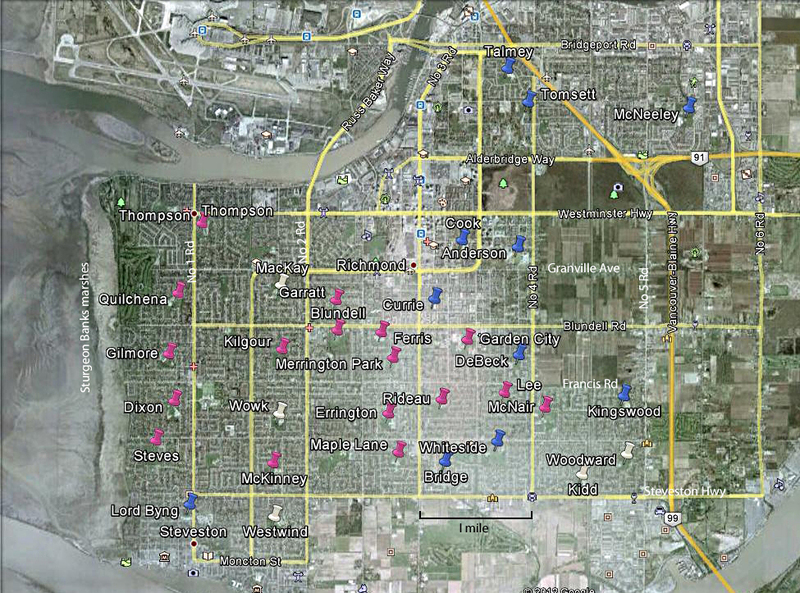 3 Rd that showed evidence of geese, 13 of 16 (81%) had areas with moderate to heavy damage. East of No. 3 Rd, 4 of 6 schoolyards (67%) that had signs of geese showed moderate-heavy damage. Three of these were between No. 3 and No. 4 Rd., and the fourth was on the east side of No. 4 Rd. (McNair Secondary). 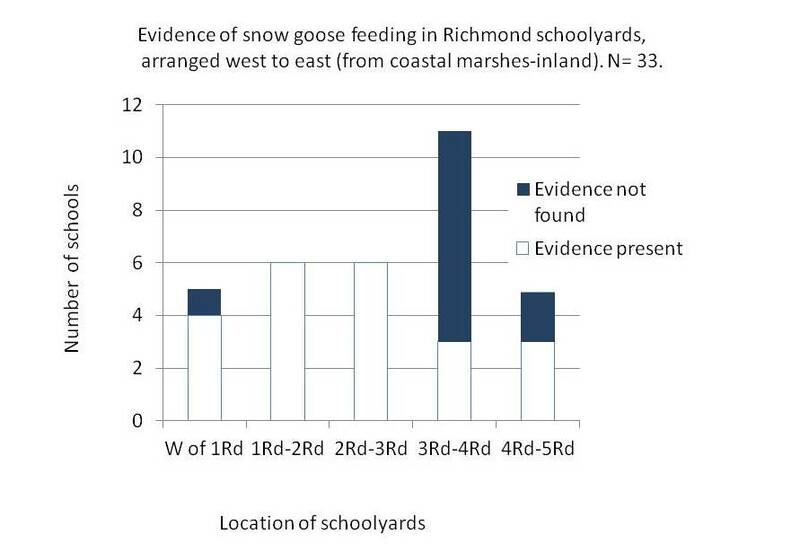 For 19 schools or comparable grassy parks that had evidence of geese, the average area of grass was 36,537 m2. The range was from 6,300 m2 (Merrington Park) to 78,300 m2 (Steves). 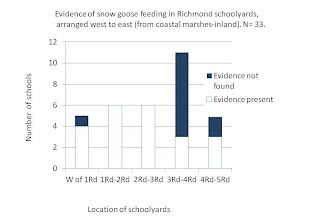 For 13 schoolyards that showed no evidence of geese, the average area of grass was 19,192 m2. The range was from 6,300 m2 (Lord Byng) to 53,500 m2 (McNeeley). 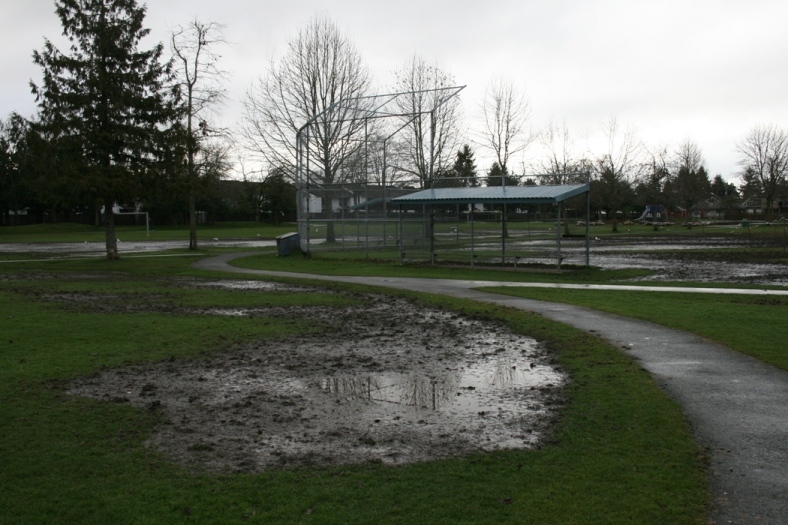 Of 15 schools that had moderate to heavy damage to fields, all 15 had standing water in the grass. Location in Richmond is a factor determining if fields are used by geese. Fields closer to the Sturgeon Banks and northwest Delta marshlands are more likely to be visited and used by geese. Closeness to downtown Richmond and commercial areas (e.g. Bridgeport Rd.) makes use of fields less likely. Fields with standing water are damaged the most, and well drained fields show very little damage. Both Walter Lee Elementary and Garden City Elementary have wet fields that have been heavily eaten. In between, DeBeck School remained untouched by snow geese. It is unclear if this is because geese find it easier to rip up grass in wet areas and prefer to feed there, or if wet areas are more physically fragile and more easily damaged by goose feeding activity. Although a large size range of fields was used by geese, the larger fields were more likely to be used to the point of being seriously damaged. This might be because due to their large sizes they are more likely to have localized wet areas that attract geese and make feeding easier. Examples of such fields are at Steves Elementary, Blundell Elementary, and McNair Secondary School. The findings of this study raise further questions. 1) Do the geese start feeding at fields near the shore and gradually move inland, or is it less gradual? 2) If a schoolyard is used for feeding, does it make it more likely that nearby schoolyards will also be eaten? (Is there a contagious effect?) A longer, more detailed study that covers the entire winter season (from snow goose arrival time in October to March), checking schoolyards repeatedly could address these two questions. 3) If standing water content is changed, increased or decreased, will that either attract or discourage geese? 4) How do human activities, including traffic noise, foot traffic, off-leash dogs, etc., effect field use by geese? These factors were not investigated in this study. Snow geese grazing at Garden City Elementary School. By knowing what attracts or discourages snow geese, fields could be altered to make them less appealing to the birds, which would result in less damage to grass and cleaner walkways and playgrounds during the winter. January 2012 Lesser Snow Goose Update. Marshnotes Winter 2012. British Columbia Waterfowl Society. P. 5. The Lesser Snow Goose Story. www.reifelbirdsanctuary.com/snow.html. British Columbia Waterfowl Society. Last updated 12 Feb 2012. Lesser Snow Geese: an indicator of wildlife sustainability in the Georgia Basin. 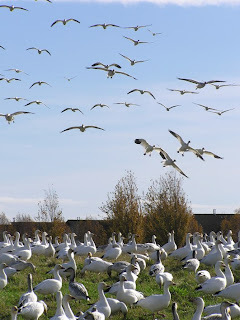 www.ecoinfo.ec.gc/env_ind/region/snowgeese/snowgeese_e.cfm 4 pp. Last updated 3 June 2005. Smith, T.J. III and W.E Odum. 1981. The effects of grazing by snow geese on coastal salt marshes. Ecology 62: 98-106. Burton, B.A., R.J. Hudson and D.D. Bragg. 1979. Efficiency of utilization of bulrush rhizomes by Lesser Snow Geese. Journal of Wildlife Management. 43: 728-735. Will you be sharing the results with the powers that be at S.D. 38? That could easily serve as a district wide project, with each school documenting goose activity in their fields! Please pass on my complements to the author! Anon, thanks for the comment. Eskarina, we talked about that during the first visits to the various schools, but it is a complicated and dynamic problem (moreso than was expected), and would be difficult to standardize throughout the district (in terms of parameters, measurements, coverage amounts,etc.). Not impossible, but difficult. Teacher volunteers would be needed too, probably. Who knows how that would go (the way things have been going). Thank you for the comment and compliment. He's quite pleased to see it online and have people respond. Excellent report, Owen. I'll pass this on to my teacher-friend who has complained in the past about the snowgeese. Hi Tim, Thanks, I'll make sure he sees your comment.